Lisa’s experience is not uncommon. Soft-tissue work can have a profound effect on the body. By freeing the connective tissue matrix, a therapist’s hands act as gentle guides to show the body a new way of organizing. But what’s actually happening in this exchange and how do soft-tissue techniques work? Aside from being the largest single organ in the body, the connective tissue or fascia is the immediate environment of every cell. Fascia is not made of living cells, but a web of protein fibers and a liquid/gel complex that makes up the spaces between the cells. Fascia forms the framework that holds the cells together, the sheets that bind and separate tissues, and the structural components of the muscles, tendons, ligaments, and bones. Connective tissue lines all the body cavities, provides the framework for the minerals that create cartilage and bone, and separates the muscles and their individual fibers. It so permeates the body that if you were to remove every other kind of cell and leave the connective tissues in place, you’d still be able to see exactly what you looked like. If you’ve ever prepared fresh meat for cooking, say a chicken leg, remember what the tissue looked like when you removed the skin. That thin white/clear film covering the muscle is fascia. Now imagine this fascia not only covering the muscle, but permeating the muscle belly, separating all the individual muscle fibers, dividing muscles from each other, and forming the structural framework for the whole body. This framework includes muscles, bone, skin, and organs. Fascia does other things, too. Unlike a salamander that can grow back a severed arm, humans don’t regenerate, they repair. Connective tissue is the material that repairs broken bones, torn muscles, deep wounds, cuts, and surgeries by forming scar tissue. This same material can form web-like adhesions when it gets too enthusiastic, causing problems, especially in body cavities like the abdomen and pelvis. And it’s very strong. Connective tissue has a tensile strength of about twenty-two hundred pounds per square inch, which could explain why it’s so hard to stretch tight hamstrings. Connective tissue possesses special properties that make it possible to change its shape and pliability. Bodyworkers take advantage of these properties to get the kinds of results my client Lisa experienced. Connective tissue has the ability to change state, depending on its level of energy and activity. This property, called thixotropy, means that the fascia can move from a gel-like state to a liquid-like state and back. Just like Jell-O, fascia becomes more fluid when it’s warmer and more gelled when it’s cooler or more static. In fact, the gelatin in Jell-O is rendered animal protein and comes from exactly the same kinds of tissues as our own connective tissue matrix. It’s easy to feel this in your own body when exercising. When you first start your workout, you may feel stiff and tight, but as you warm up, you notice greater ease and comfort. Your fascia is moving from a gel to a liquid state during the warm-up. The same thing happens when your massage therapist works on you. But instead of your own movement raising the energy in your tissues, the therapist’s hands add heat, energy, and motion to the fascia. And her specific hand placement can free and mobilize places that exercise may not be able to get to. 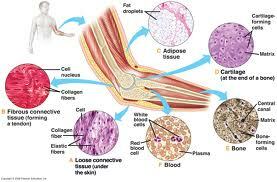 Collagen is the basic building block of fascia. It’s not a living cell, but a long protein molecule that forms sheets, ligaments, tendons, the covering of bones (called periosteum), and the framework for the minerals that form cartilage and bone. These fibers are made by a special kind of cell called a fibroblast. Fibroblasts can travel anywhere in the body that they’re needed (for example, to repair a cut or a broken bone). Once collagen fibers are formed, they’re directed by the body to organize into the appropriate structural formula, and they build this tissue by gluing to each other with molecular hydrogen bonds. The good news is that hydrogen bonding causes collagen to build along lines of tension, making tendons and ligaments stronger. When you lift weights or begin a running program, you’re not only building joints, bones, and muscles, you’re increasing the tension in the connective tissue, which makes it stronger, too. That’s why it’s important to gradually increase your workout level. You’ll avoid injury by giving your muscles, bones, and connective tissues a chance to respond to the challenge. The bad news is that collagen fibers also build hydrogen bonds when there are abnormal lines of tension. When you have poor posture or poor biomechanical patterns, you’ll develop a buildup of collagen that eventually holds you in those places. The hydrogen bonds glue your collagen to the point where you can’t stretch or exercise out of the pattern. Inactivity also causes collagen to glue together. Anyone who’s been casted for a bone fracture knows that the hardest part of recovery is getting back range of motion in joints kept immobile for the six weeks it takes the bone to heal. This extreme stiffness is hydrogen bonds at work on the fascia in and around the joints. Structural integration, Rolfing, Hellerwork, neuromuscular therapy, myofascial release, and many other bodywork approaches rely on specific techniques designed to soften and organize the connective tissue matrix. Collagen fibers are strong in tension–like cables or rope–but the hydrogen bonds that hold them together are weak against shear forces. A shear force is one that’s applied across the length of the fiber–like scissors or shears. By applying gentle shear forces into the connective tissue matrix, a bodyworker trained in deep soft-tissue work can encourage the release of some of the hydrogen bonds and stimulate the collagen fibers to unglue themselves. And while the collagen isn’t actually a living cell, when its hydrogen bond glue has been softened, it will be more pliable and the body can then mold in a new way. Clients frequently ask me what I mean by “releasing tissue.” My sense is that I’m accessing all of the properties of the fascia at once with my touch. I’m encouraging the gel part of the fascia to become more liquid-like, I’m gently breaking hydrogen bonds between fibers, and I’m communicating with the whole connective matrix regardless of where I’m working in the body. It feels like releasing to me and to them. The tissue softens and melts under my hands, and I feel a flow that moves from my fingers and through my client’s body like a wave. Often the client will take a deep breath, an autonomic response to the change that signals a deep point of relaxation and the tissue is palpably softer. What seems like magic to the client is simply the body’s natural response. The connective tissue matrix knows how to do its job. It changes with the right kind of input. It organizes itself along lines of tension so that we can move freely and confidently. It softens and deforms when it’s warmed, and it reorganizes throughout life as we grow, change, and age. And soft-tissue work can encourage it do all these things in a way that makes us healthier. By Cathy Ulrich who lives, works, and plays in Fort Collins, Colorado. She’s an advanced Rolfer, physical therapist, and writer. Contact her at cathy@circleofbeing.com. Originally published in Body Sense magazine, Spring/Summer 2007. Copyright 2007. Associated Bodywork and Massage Professionals. All rights reserved. Gallery | This entry was posted in Deep Tissue Massage, Energy Medicine, Holistic, Massage, Massage Therapist, Massage Therapy, Our Center, Therapeutic Massage and tagged body cavities, Body cavity, Cell (biology), Collagen, Connective tissue, connective tissue matrix, Hydrogen, medical, Muscle, muscle fibers, protein fibers, Rolf, soft tissue techniques, tendons ligaments. Bookmark the permalink. Hey – I’m always searching for decent blogs and sites associated with Active Release Techniques/Chiropractic and wellness in general. The chiropractor I see locally here uses A.R.T.and he has really helped specifically when I include that with massage therapy. It’s difficult to find a good clinic – how can you evaluate who is good and who isn’t? Other than patient testimonials and the like – would be nice to have a checklist or something to avoid wasting time with poor providers. Thanks for your time.